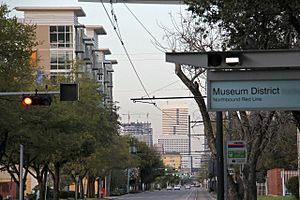 The Houston Museum District currently includes 19 museums that recorded a collective attendance of over 8.7 million visitors a year. 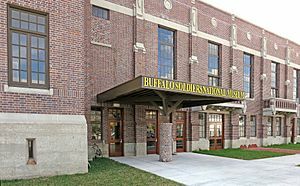 All of the museums offer free times or days and 11 of the museums are free all the time. Thursdays the Museum District gets particularly crowded because of museum free days. On Thursdays, The Houston Museum of Natural Science is free after 2, The Children's Museum of Houston is free after 5 ht], The Health Museum is free from 2-7, and the Museum of Fine Arts, Houston is free all day (courtesy of Shell) . 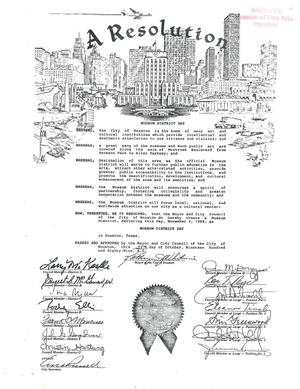 Bordered roughly by Texas State Highway 288, Hermann Park, U.S. Route 59, and the Texas Medical Center, the Museum District specifically refers to the area located within a 1.5-mile radius of the Mecom Fountain in Hermann Park. 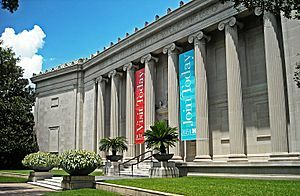 The Museum District Civic Association compared the area to Georgetown in Washington, D.C. and to the French Quarter of New Orleans. Parking in the Houston Museum District can be tricky if you visit on Thursdays, weekends, HISD Spring/Summer/Winter vacation days, or evenings when Miller Outdoor Theater is hosting a popular show. A parking lot adjacent to the McGovern Centennial Gardens on Hermann Drive was added in 2014. You may park there for free. Parking in the lot across from the Law Building at MFAH is also free. You may also park at the zoo or in the lot near the Rice University Light Rail Station for free (there is a 3 hour time limit). You may pay to park along Hermann Drive or on side streets, in the HMNS garage, or in various garages. 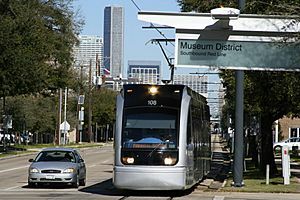 You may also park along the MetroRail Line and take the light rail train to Rice University or The Museum District stops. Houston Museum District Facts for Kids. Kiddle Encyclopedia.